This miniature relief depicting the Coronation of the Virgin was probably made in about 1400, in France, probably Paris. 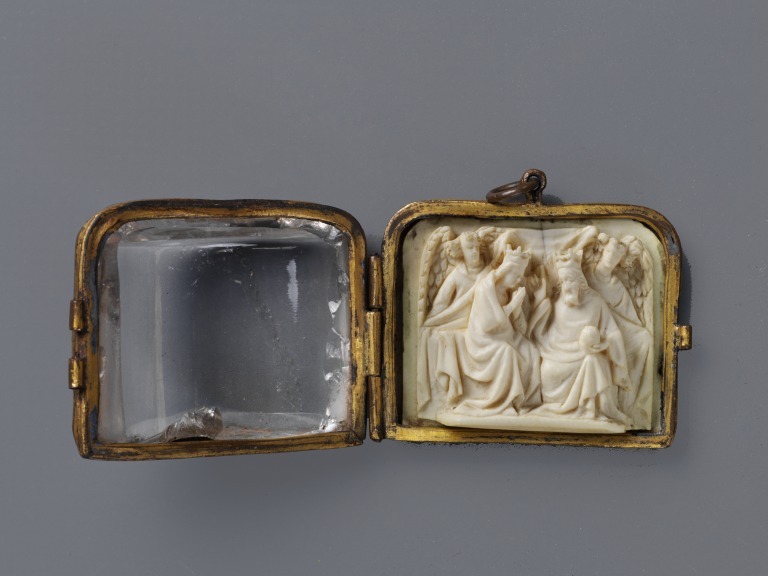 The ivory relief is mounted in a gilt-copper and mother-of-pearl case with a rock crystal front. The case is hinged and has a ring on the upper edge, to allow to be hung on a cord or fine chain. Acquired as English, this origin is not persuasive. The carving is not of the highest quality, but it is sufficiently close to other French micro-carvings which have convincingly been placed in the first two decades of the fifteenth century. The iconographic type of the Coronation of the Virgin was particularly popular in France in the late fourteenth and early fifteenth centuries. 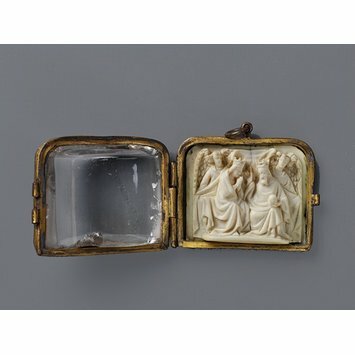 These miniature ivory reliefs should be viewed in the same light as their kleinplastik counterparts in precious metals and enamel. And the later pieces, from the second half of the fifteenth to the early sixteenth century, are also often comparable to works in other materials, such as the more numerous mother-of-pearl roundels. Both drew on the same graphic sources and brought sacred images into the possession of the pious. Ivory relief depicting the Coronation of the Virgin. The Virgin and Christ, both crowned, are seated on a draped throne; with clasped hands to the left of Christ, who, holding an orb in his left hand raises his right in benediction towards her. An angel holds back a drapery on either side. Within a crystal and gilded copper case, with a mother of pearl back. The case is hinged and has a ring on the upper edge, to allow to be hung on a cord or fine chain. The front is made of a semi-circular rock-crystal prism, the back of a plaque of mother-of-pearl. Purchased at Christie, Manson & Woods, London, 20 February 1923, lot 81 (£13 13s); previous history not known.